Yes! It’s all about the Béchamel sauce…and the cheese. Enjoy. 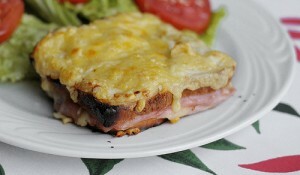 A Croque Monsieur with Béchamel Sauce: A Great Way with Leftover Ham. Photo by Thais-Gouveia via Flickr. 1. Preheat the broiler. Lightly grease a baking sheet. 2. For the béchamel, in a small saucepan, melt the butter over medium heat. Whisk in the flour to form a smooth paste; cook and stir for 1 minute. Do not allow the flour mixture to brown. Gradually pour in the milk, whisking as you pour. Cook and stir over medium heat until the sauce is thickened and bubbly. Cook and stir for 1 minute more. Season with salt and pepper. Remove from the heat. 3. Place 2 toasted bread slices on the baking sheet; top each with 2 slices of ham and divide 1/4 cup of the cheese atop the ham. Top each with the remaining toast slices. Divide the béchamel over the tops of both sandwiches (it’s fine if some streams down the sides). Scatter the remaining cheese atop the sauce. 4. Broil the sandwiches about 4 inches from the heat until heated through and the tops are irresistibly golden and speckled with polka dots of browned cheese, 4 to 6 minutes (watching constantly). Transfer to individual plates and serve. Ever spread a little mustard on the bread? No! I have not done that, but it sure sounds good. Thanks for the idea.